The fledgling Libertas Center for Interconfessional and Interreligious Dialogue has won the annual “Face of the City” award bestowed by Lviv’s City Council and its Chamber of Commerce. The CIU and Berrie Foundation-sponsored non-profit was cited for its work and outreach promoting dialogue and understanding among the oft-times contentious religious groups in Ukraine. 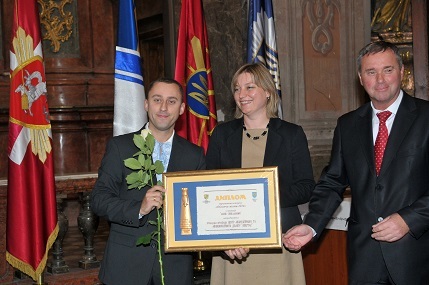 (left to right): Dr. Taras Dzyubanskyy, Libertas Center Director receives the “Face of the City” award from Mrs. Viktoria Dovzhyk, Lviv City Council and Dmytro Aftanas, President, Lviv Chamber of Commerce and Industry. The Libertas Center was opened only a year and a half ago, in May of 2013, by Dr. Taras Dzyubanskyy, its director and a former student of Rabbi Bemporad’s at the Pontifical University of St. Thomas Aquinas (the Angelicum, Rome) and of the Russell Berrie Fellowship in Interreligious Dialogue there. Both Rabbi Jack Bemporad and CIU Board President Dr. Anthony Cernera addressed the inauguration in May of 2013. The winning contestants were selected for their excellence in creating business, investment, jobs, and other social opportunities, thus promoting Lviv as an attractive location in economic, social, and humanitarian spheres. The Libertas Center was a prime candidate because Dr. Dzyubanskyy organized over ten interreligious and ecumenical events this year alone, attended by nearly 1000 people. This is the first time an entity promoting religious exchange has won the award, which is not surprising since the Center is the first of its kind in Ukraine. There were 30 finalists in the “Face of the City” contest and 15 winners, all of whom actively participated in the “Maidan,” or “Revolution of Dignity” last fall and winter. The movement was named the “Maidan” because thousands gathered at the main maidan, or square, in Kyiv, demonstrating against the then government, which voted not to join the European Union in favor of ties with Russia. In addition, the people and many organizations, businesses, and churches voiced their opposition to what they believed to be corruption and oppression within the government. The award ceremony took place in the ornate Church of Saint Peter and Paul, originally built as a Jesuit church in the 17th century. Although still beautiful, the historic building suffered abuse during the Communist era, when it was used for the storage of between two-three million books, as well as volumes from the University of Lviv. According to Dr. Dzyubanskyy, it is in great need of funds for restoration, since it is a landmark building and is now used as the main ecumenical church for military chaplains. The Libertas Center got its start with a grant from the Berrie Foundation, as well as CIU funding for its Roundtable in May, 2014, which addressed the war and chaos in Eastern Ukraine in light of the teachings of Nostra Aetate. 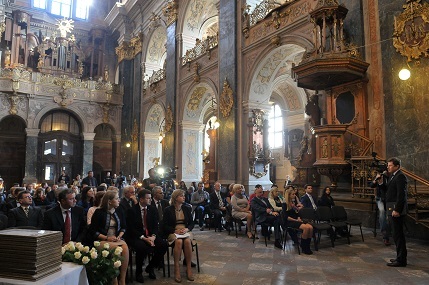 Finalists of the “Face of the City” award, members of the Lviv City Council and of the Chamber of Commerce and clergy sit in the 17th century Church of Saint Peter and Paul, waiting for the announcement of the winners by Volodymyr Korud, Head of the City Councils Department of International Relations.